I am taking the Clean and Simple on line card-making class (series 3) these days. The new blog Virginia's View Challenge certainly keeps my busy hopping (it's all fun, don't get me wrong!). Finally I got some time to create a card inspired by the class from Day 3 (mainly from Jennifer McGuire's video). I made a mask with the butterfly die cut and stamped the text, flowers and sentiment in various colors. It was so fun and relaxing to make this card! For those who had been submitting cards to Virginia's View Challenge, here is a photo for you! love both your card and the pic of Ryan! Just gorgeous! I'm talking about your card, and so is Ryan! Virginia this is gorgeous! You rocked the technique! Gorgeous card! I am taking that class too, but so far all I have done is printed out the PDF's. I love all the interest you managed to pack into your masked image. Perfectly executed and beautiful! Just gorgeous Virginia! Oh and your card is gorgeous too (wink,wink)! What a great one layer card. So bright and cheerful...I love it! Hey girl, I love your card...especially the script background! Such a pretty butterfly! Loving your card! LOVE the masked butterfly...thanks for the awesome inspiration! Oh I really love this. Love all the different colors that were used and layered in the butterfly. Gorgeous! This is awesome...love the masking and stamp layering! Looks awesome! Great take on the masking technique, Virginia! The script background is fabulous. The masking and stamping are stunning, Virginia. Boy, did you nail this. So impressive. I also tried this, though not a successfully. Just beautiful, girl. Gorgeous card, Virginia! I love your butterfly and all those pretty colors...wow! So nice to see our sweet boy Ryan with words of encouragement, too...thanks! So pretty! :) Love all the colors and text...simply, perfect! Way to rock a one layer card! I love the colors you chose and that simple, one word sentiment! A+, Virginia! A++! argh...a stab in my heart that picture of Ryan!!! Love your watercoloring, your creativity has no end!! 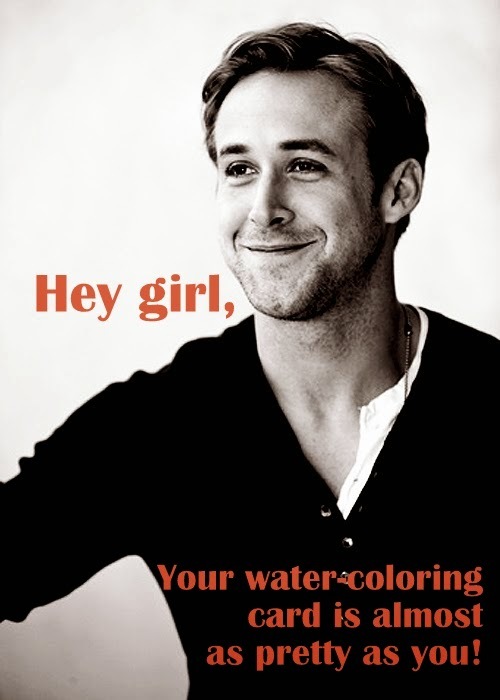 I absolutely love this Ryan Goslin's Hey Girls... So funny, share them all the time! Such a lovely image and so wonderfully done! This is brilliant! Virginia, I'm woefully behind in commenting, but here I am, running shoes tightly laced, planning to catch up. Your butterfly here is absolutely stunning! I think I 'need' to sign up for this class, based on your delight here. WOW!! LAST One with Ombre Effect! Use that ( Colorless) Copic Marker!